Color for this breed is pure White, outside the US other colors like Blue are being developed. Sultans are an easy to identify breed. With their usually pure white feathering, their full crest, beard, muffs, V-shaped comb, large nostrils, low wing carriage, vulture hocks, profusely feathered shanks and toes, and five toes on each foot, they have more distinguishing features than any other breed. Sultans are an old breed that originated in southeastern Europe and were bred in Turkey, where they were known as the Serai Taook/Tavuk (Sultan’s Palace Fowl), legend having it that they were primarily used as ornamental fowl in the Sultan’s gardens. It is not known what breeds went into their makeup originally, but Polish chickens were used by early breeders in the UK and US to improve the breed. They were first imported into England from Istanbul in 1854, and into the US in 1867and today they are a rather popular show bird and ornamental bird. The APA recognizes solid White, by far the most popular color, they are also occasionally found in Black and Blue. Sultans tend to be active very friendly gentle birds and are said to be very talkative. They do well in confinement and many breeders raise them indoors. They are popular in urban gardens since they do little damage to the grass. Their mild temperament means they can be bullied by more aggressive breeds and do best in flocks with similar temperaments. They are fairly temperature tolerant but because of all their extra feathering they do not do well in wet or muddy weather and do not do well free ranging. The hens are fair layers of small/medium white eggs, they usually are non-sitters. It was recognized by the APA in 1874. It is on The Livestock Conservancy's Critical list. These beautiful white birds are adorned with a fluffy full Topknot, a muff and beard, vulture hocks, feathered legs and five toes. They are gentle, docile birds with sweet dispositions. They tend to be easily caught, which make them a good choice as pets for children. Care should be taken while free ranging these birds, as they are subject to predators. They are also somewhat delicate and may need some extra care to keep in cooler climates. BlackHackle, RiverStorm and fishnet1971 like this. "Sultans could be the very best birds you ever own"
Pros - Good layers of medium-large white eggs. Hatch and raise their own chicks; dads are good fathers, too! Cons - Can be difficult to keep clean, especially if you let them forage. Harder to safely mix in a flock with other breeds, due to their in-between size. My first Sultans were a complete surprise to me. Well, not a complete surprise. They looked like Sultans, white with crest, muffs, vulture hocks, five toes, and feathered legs and feet. I had heard that the boys were about 6 pounds, the girls were about 4 pounds, and that was true of my two pairs. I had also heard that they laid a medium-to-large size egg, and that was true of my two hens. But then, all of the rest of what I heard was shattered. "Non-setters"--oh, so not true! The very first time I left eggs in overnight, that was enough to set one of the hens to...setting. I removed one pair of Sultans from the cage and gave them alternate housing, and that second hen continued to lay in her new cage. I left one roo with the first hen. After 25 days, I candled the eggs under the first hen. All were fertile, but all had died part-way through the hatching period, probably due to a couple of our Missouri early-March rain-and-freeze cycles. I took five Crevecoeur chicks who had hatched a few days earlier in my incubator and tucked them under the Sultan hen that night, removing her other eggs. The Sultan hen started talking to the Crevecoeur chicks immediately, and they responded. In the morning, I stood anxiously by the cage as dawn broke, and discovered that the Sultan roo was already coaxing the Crevecoeur chicks to food and water. The Crevecoeur chicks were fully adopted and raised by both Sultan rooster and hen. This pair of Sultans raised these chicks, and went on to raise another brood of four of their own in the same year. When I left eggs for the other Sultan pair, they quickly brooded and raised their own family. In foraging ability, I would rate Sultans more in the "rototiller" than in the "non-garden-damaging" category. Since then, I am on my fifth generation of Sultans. The roos are great fathers, the hens are wonderful brooders (given the right housing, which I didn't give them the first time around) and mothers. It has been disconcerting to see how the Sultans sometimes will start a family in the late fall, yet they are good parents, and have not lost a chick yet, despite the cold. Their laying pattern is typical of setters, about 8-12 days of laying, two weeks or so of not laying, then repeat, if they are not setting. This continues all year long, if you collect the eggs. If you forget to collect the eggs, then it's off to the brooding/hatching phase! My Sultans typically talk to one another almost constantly. I listen in to these musical conversations as I work in the yard. Sometimes, if I am close to or actually in their coop, my Sultans talk to me. The roosters and hens have never shown any indication of ill will toward me or any other human I have in tow. But we are careful not to get between them and their mates or chicks. I have to say, Sultans are a rare breed, and the individuals I have may not be typical of the breed. However, you will want to note that, as a rare breed, individual Sultans that anyone has may not be typical of the breed. Also, chickens are flock animals, and if you only have one, and you (as far as they can tell) are the only other member of their flock, then they may not behave in a breed-typical way. In my experience, Sultans are a great bird for anyone who wants to raise their own birds, and have eggs, too! We haven't eaten any of ours, although I understand that they are good eating. For us, it doesn't make sense to eat them because we can sell them at a much higher price than it costs for us to buy a chicken dinner. But we do eat some of the eggs. 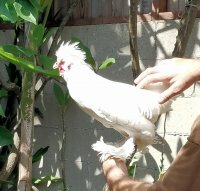 I got my Sultan rooster as a chick, on accident, thinking he was a Polish hen. Much to my surprise, soon after his feathers really started coming in, I realized what HE was. I wasn't thrilled about ending up with a Rooster, but he is certainly a charmer! Of my 7 hand raised chickens, he is by far the most loving bird I have had. He is the first to run up to the door when I come out to visit and he LOVES to be held and loved on. I can cradle him in my arms and carry him around while he sleeps. He does great with the hens and has never shown anyone any aggression. The only "con" is that since he is white, and his feet are feathered, he looks filthy all the time. But, that being said, he is VERY tolerant of me wiping him down from time to time to clean him up. He enjoys his occasional foot washes ! Overall, if you are looking for a PET, this breed has won me over. I don't think they would disappoint. "Lovely Breed for a Pet"
I have owned and raised a few Sultans over the years. They are a lovely lap chicken and are a good choice for those with children. As is expected with such a breed, they're rather lacking in brains and need substantial protection from predators. I have found they are rather prone to disease, but that can be managed with careful breeder selection and management practises. Overall, I'd certainly recommend them for anyone looking for pets. Edit: urban dwellers might also think of choosing these birds. They don't range much at all and have zero inclination to escape from fences. Ooh, they look fun! They also look like Polishes. My comments are based on my first Sultan roo acquired at juvenile age. Quirky and fun. Very nice temperament for owning as pet. Doesnt seem to mind being held and gets along fine with roos of other breeds probably because he doesnt seem to need to collect a harem of hens. He has his favorite hen and pretty much sticks with her. She is broody currently so he is at a bit of a loss for company. Still he does fine and seems to gravitate to his gal when she gets off the nest for a bit during the day. Im looking forward to see if he helps her with the chicks once they hatch. Well Quiet doesn't describe my Sultan! It turns out this little guy is a male. Hatched early April, (April fools) he was purchased assuming to be a female of a different breed. I have neighbors, who's sleep I'm infringing on. Anyway, This Male White Sultan is very cool looking. He's friendly to me, and comes up to be petted at times. Otherwise, he's going around trying to keep the 2 Orpington, and 1 Brahma females in line. He is going to Magnolia Bird Farm in Corona Saturday @ 9:AM - 8/12. 11 hours from now, if no one in the BYC community claims him first. He will be sold or re-homed by them. Sad to see him go, but I'm forced to. Haha! Only when they get very dirty. The feathers on his feet can carry a lot of nasty stuff, so I try to keep them as clean as I can to prevent potential infections. "You know you love your chickens when...:"
Seriously, you wash his feet? Aww.. so cute! I don't have on but my rhode island red (Red) acts the same way. lol Chickens make awesome fine feathered dogs.. I have 4 of these! 3 cockerels, 1 pullet. One of the cockerels has disoriented toes, so it walks like a crab. He gets around okay though - it was something he was born with. 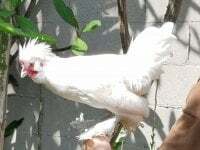 SEEKING..Eggs from…White Silkies, White Sultan Chicken, White Crested Blue Polish Chicken, White Crested Black Polish Chicken, Blue Ameraucana Chicken, or German Spitzhauben Chicken Fertile eggs Wanted. Any of the species mentioned are Chickens I would like to hatch in my incubator. Shipping is easy. Eggs (fertile only) can be placed in any foam egg carton filled with vermiculite or saw dust, etc. They can be placed in a standard box surrounded by bubble-wrap. Movement and striking a sealed container will NOT harm the eggs if shipped UPS, FedX, or USPS. X-ray has not hurt my eggs or damaged the embryos either. If you have any eggs available, please state your fee per egg and estimated shipping to Dayton, Tennessee 37321. Email is [email protected] or [email protected].